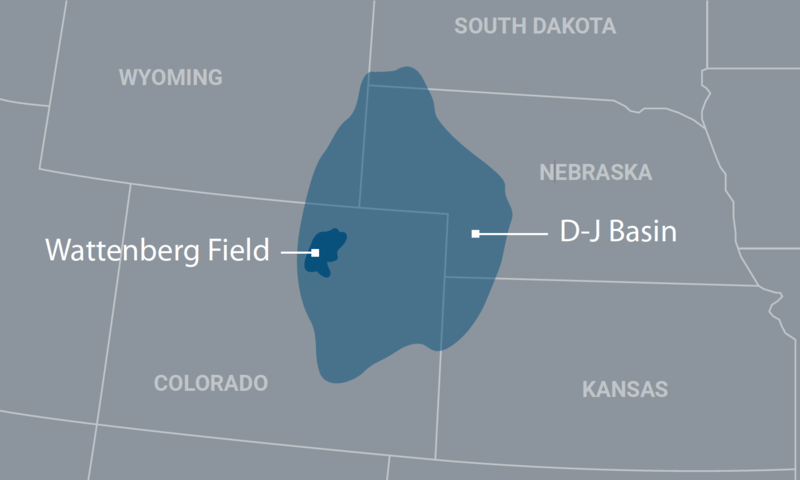 An operator working in the Denver-Julesburg (D-J) Basin acquired two wells completed in September 2015 with Tartan cemented MultiFrac™ systems. Targeting the Niobrara formation chalks in the Wattenberg Field, the wells had not been stimulated by the previous company due to the uneconomic conditions. The wellbores were left containing untreated water and the operator planned to stimulate the wells in April 2017 – almost 18 months post-install. The uncertainty with leaving any multistage completion system in the wellbore for extended periods of time is whether the tools will still function as designed. In this case, the Tartan MultiFrac™ sleeves and Cemented Initiation Subs (CIS) were used to complete the toe stages of each well to enable enhanced operational efficiency. The patented MultiFrac™ sleeve enables limited-entry stimulation though multiple sleeves actuated with a single ball. After the ball shifts all the sleeves within a stimulation stage, the liner is pressured up to open the patent-pending BurstPoint™ ports. During installation and cementing operations, the BurstPoint™ ports remain completely closed preventing cement from entering the system to ensure reliable ball-drop stimulation operations. The MultiFrac™ systems run in the Niobrara wells had three sleeves per treatment stage up to 10 stages (30 tools) with 1/12-in. ball seat increments between stages. The wells were initially pressure-tested for integrity to 9,000 psi (62 MPa). Stimulation operations on both wells were then successfully initiated through the CIS, which enables full fracture treatment of the toe stage through the BurstPoint™ ports. Dissolvable metallic actuation balls were used to shift the three MultiFrac™ sleeves per stage, with positive pressure indications at surface (Fig. 2). An average 200,000 lbs of proppant per stage was placed at 5 ppg slurry concentration in crosslinked gel frac fluid with rates reaching 53 bpm and maximum pressures of 8,800 psi (see job summary). The pressure charts also showed no evidence of port erosion during the treatments due to the hardened steel inserts of the BurstPoint™ ports. Overall, the Tartan downhole tools performed as expected, even after sitting 18 months in untreated water at 195°F and 3,600 psi formation conditions. While these may be extreme circumstances, the successful stimulation through the tools demonstrates their durability and reliability. Because of these successful wells, the operator sees the MultiFrac™ system as an excellent fit for completing the toe of their extended-reach laterals that are drilled to a measured depth of between 2 and 3 miles to enable exploitation of reserves under areas with surface access restrictions, such as populated areas.